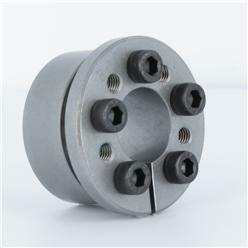 The B-LOC B106 Series 18mm Keyless Bushing provides a high capacity, zero-backlash shaft to hub connection for shafts measuring 18mm in diameter by means of a mechanical interference fit and transmits up to a maximum of 236 Nm of torque. Best Suited For: Applications where having no axial movement of the mounted component relative to the shaft during tightening is critical and recessed mounting is not important (component mounts against the flange of the bushing). B-LOC B106 Series 18mm Keyless Bushing provides a zero-backlash frictional connection that will never wear or pound out and can accommodate high-torque, thrust, bending, and/or radial loads. 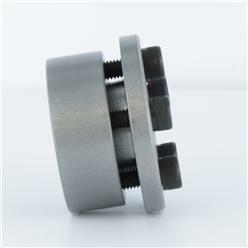 Their shallow, single taper design with integrated push-off threads maintains exceptional concentricity and the ability to transmit bending loads. The B-LOC B106 Series Keyless Bushing design eliminates any axial movement during installation making the installation process more precise. This series is also RoHS compliant. ** B-LOC Series B106 Keyless Bushings are also available with optional integrated spacer sleeve (ideal for very narrow drive elements). 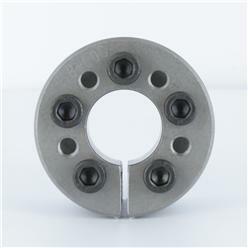 Spacers are 0.275” wide for B106 sizes with D = 2.559” and smaller, and 0.315” wide for all others.